I sincerely hope and pray that you have had a good Christmas. What makes a good Christmas? Ideally, taking the time during the Advent Season to reflect on the Christmas Story, and how the events of Jesus' birth affect your life in the 21st century. That was the topic of Sunday's message, Reflections on Christmas. There were two specific things in the story of Luke that we reflected on. If you would like to read the message, or hear the audio recording, click the link below. Thanks for reading. May your reflections bring you closer to your God. In Sunday's message, we looked at Mary. Mary is a very interesting character in the Christmas Story. She is certainly a very important character, after all, she gave birth to God's Son, our Messiah. But what do we know about her? What did all this mean to her? I think that Mary is a model of faith in the early pages of the New Testament. In fact, I think we're pretty hard pressed to find anyone who trusts God as much as Mary did. To see why I feel this way, feel free to read the message. There will also be an audio link to hear the message. This Sunday in the Advent Calendar is the Sunday of Joy, and our worship service seemed to be filled with joy. There is so much be thankful for, and that thankfulness and gratitude fills us with joy. God is so good. The message on Sunday was from Zephaniah. There is a lot going on in Israel at the time the prophet Zephaniah was prophesying and writing. It was also an important time for the people of Israel. I know when things are important in the Bible because they're mentioned more often. The more often something is mentioned, the more important it should be. And the events leading up to and immediately following this time are recorded here in Zephaniah, in Jeremiah, in Habakuk, in Daniel, and in 2nd Kings and 2nd Chronicles. With this much attention, it must be an important time. Indeed, history shows it, as within twenty years after his prophecies, Babylon comes in it's first attack and carries away a number of exiles. With it came the end of Israelite sovereignty until the 1940's. Surely this is important in the history of God's people. Is there anything we might learn from it? What can we understand? What lessons are there? Our Sermon Message for this week looked at the practice of the Season of Advent, a time of preparation for Christmas. A time of reflecting on Jesus' first coming, and looking forward to His next coming. The message explored a spiritual pilgrimage to a Bethlehem of sorts, a spiritual place, the starting place for our spiritual journey, the birthplace of all faith. How do we get there? What would be important to reflect on in this journey? If you are interested in reading hte full text of the message, or listening to the audio recording of the message when it's available, click the link below. Sermon - So, You Want To Go To Bethlehem? Advent is a time of preparing ourselves for Christmas. Both in preparing ourselves for the holiday of Christmas, and, even more importantly, in preparing ourselves for the next Christmas, if you will. Jesus said He will come again, and we, as Christians, believe that, and look forward to that. Advent is a time for making sure we're ready when He does come back. The mention of Advent always stirs thoughts of waiting. . .
in the daily events of our lives, and the second coming in the future. I've been thinking that we've got it all wrong. We need not wait for God. God is always present, always with us. That's what the name Emmanuel means: God-with-us. And, that's the primary truth we hear in the Scriptures. God created us, and calls us into relationship. God is indeed present with us, and especially in the person of Jesus the Christ. No, this Advent, I've come to see that it's GOD who waits for US. . .
. . .waits for us to notice that we are indeed created by God. as well as deficiencies and lack of qualities. God only sees our goodness, and waits for us to notice too. in which God is with us, always. We know the Creator in the beauty and amazing capacities of creation, both earth and human. We know the Creator when we experience love. We know the Creator when we can not explain or understand mystery. . . .waits for us to notice when we observe people acting in the image of God: in covenant with one another, both those known and unknown, both those alike and those very different. that can only be filled by God's own Self. . . .in the season of Advent, as Christmas approaches, God waits for us to notice the wonder and innocence of little children. How God must long for us grownups to be more like them, without guile. It is true that in Advent we wait; but really, it is God who waits for us. May we savor and revel in that reality. This is how Paul ends his second letter. Much of this letter is spent telling the believers to watch out for false leaders and false prophets. There are people that will come, and perhaps were even there then, that will try to lead believers astray. One of the chief ways to prevent that from happening, from being led astray, is to be constantly growing in the grace and knowledge of Jesus. When we know His voice, when we know His commands, and when we are intimately connected to His Spirit, we will know when someone tries to mislead us in issues of faith. We need to be always looking for opportunities to grow in our faith, to understand our faith better, to know Jesus better and better. This is the most important step you can take in being able to identify false teachers. No matter where we are in our spiritual journey, no matter how mature we are in our faith, the sinful world will always try to challenge our beliefs. There is always room for growth. If every day brings new opportunities to draw nearer to Christ, we will be prepared to stand firm in all circumstances. 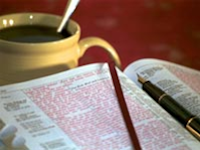 So, if you don’t already, begin a reading program to spend a little time each day in reading the Scriptures. Set aside time everyday for prayer. And join others in a Bible Study. You would be surprised how much you learn by discussing Bible passages with others. The Alpha course is also a great way to grow. The talks each week in the Alpha course can help us to see things in a little different light. They can challenge us and help us as we grasp at the meaning of our faith. The Prayer Group that meets each week is a great way to be challenged in your prayer life. Whether you feel good about praying out loud or not, being together with others who are praying is extremely fulfilling. Sometimes we need to step outside our comfort zone. That’s how we grow, and growth is what living a life of faith is all about. Seek growth, and you will find Jesus. What is important? I mean really important? I suspect that for most of us the answer to that question might depend the situation. It might depend on where we are at the time, or what we’re doing. Let’s face, there are times that it’s really important to get dinner on the table at a certain time because you have a meeting that night. Or if the kids are running late, it might be really important to get them going and off to school. If we’ve lost our jobs, and have been looking for while, it might be really important to find something, anything, to bring in some money and put food on the table. All those things are important. And they all seem really important at the time, but in retrospect, I wonder if they are the most important. When you listen to the news, you might hear of things that they tell you are really important. Currently, we are hearing about the H1N1 Virus, the Swine Flu. We’re being told daily how serious this is, and how important it is to take precautions to limit our exposure and reduce our risk of getting infected. And I suppose this is important. But is this really important? If you would like to read more, or listen to the audio recording of the message, click here. 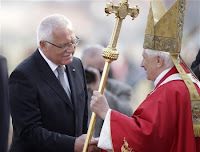 Ending his first trip to the Czech Republic, Pope Benedict XVI declared Monday that communism's end was "proof that God cannot be excluded from public life," Reuters reports. The country celebrated the 20th anniversary of Velvet Revolution, which ended decades of communist rule, during the pope's visit. The pope reminded the crowd of 50,000 young people "of powerful figures who had apparently risen to almost unattainable heights" but suddenly "found themselves stripped of their power." Speaking on St. Wenceslas's feast day, a national holiday, he continued, "Today there is a need for believers with credibility, who are ready to spread in every area of society the Christian principles and ideals by which their action is inspired." The country has one of the lowest proportions of religious people in the world, according to Reuters. I personally like this story. Communism created a system where the people worshiped they're leaders, and tried to purge any other religious pursuits from its people. Religion was seen as a "crutch for weak people." That concept failed, because man was created for a relationship with God. We cannot reach our fullest potential without that relationship, and more importantly, without the God who created us. More and more, I see America drifting further away from God. In fact, industrial countries all over the globe are drifting away from God. The concern is, if communism proved that trying to exist without God will fail, why are so many "intelligent" countries trying it? This morning, all across America, and even internationally, students met at the school flagpoles for a time of prayer before school started. I joined about 28 others this morning on the front lawn of Alfred-Almond Central School for a time of singing and prayer. It was great to see so many kids come out. And there were a fair number of adult supporters as well. Thanks to all who were there, and remember, if you couldn't make it out, you can still join them by praying now. Isn't it good to get away once in a while? Overall, we saw about twenty-two lighthouses, an Antique Boat Museum, two forts, lots of history on the War of 1918, the Vietnam Vets Moving Wall Memorial, and Presque Isle, a Pensylvania State Park that I've wanted to see for years - it was worth the wait! Anyway, we're back, I'm rested from the trip, and I promise to do better at updating this blog. I've always been a big fan of lighthouses! I don't know if has to do with the historical significance of lighthouses, the natural beauty, set on the shore, towering over everything else around them, or the marvel of building such structures long before cranes and power tools. I like to think it has something to do with the image of Jesus being the light of the world, guiding us in our spiritual pilgrimage safely to our final destination, much as the lighthouses were the lights of the shore, guiding ships in their voyages safely to port. My son Stewart and I will be taking a lighthouse tour this week. We leave today, Tuesday, and will be gone for a week. We will be seeing twenty-eight lighthouses and traveling over 900 miles. Pray for us as we travel. Pray for the bonding time, father and son, and times of shared spiritual insight. Pray for refreshment that time away can often bring. And pray that the light of the world will be our guide. Faithfulness was the topic of Sunday's message. Have you ever met someone with incredible faith? Someone you really admired because of their level of faith and understanding? This week we looked at how we might achieve that level of faith, by looking at the faith of someone who wasn't expected to have any faith - a Greek Gentile born in Syrian Phoenicia. Can we learn from her faith? To read the message, click here. Are you one that likes to doodle? If you have a blank sheet of paper in front of you, do you like to draw pictures or shapes or lines or circles? I know some people who seem to have more doodles than notes following a lecture. It doesn’t look like they got anything out of the talk when they’re done. In a sense, that’s what Jesus is doing in this passage. A woman was caught in adultery, the men who presented her wanted to stone her to death. And they were well within their rights. The law was very clear, and it called for stoning. I wonder what Jesus was drawing with his fingers as they were presenting their case. His presence and His silence seemed to make the men very uncomfortable. So much so that when He got up and suggested anyone who had never sinned might throw the first stone, they didn’t argue, though I would think that might be human nature. They didn’t defend themselves. They quietly gave up, dropping their stones and walking away. I’m really intrigued that Jesus would just sit there and doodle in the sand, while those around him were so angry they wanted to kill someone. This picture of Jesus writing in the sand is an image of almost childlike innocence, seen at a time of intense anger and even hatred in those around him. He didn’t buy into the emotions of those around him. He remained calm and in control, while so many around him were pushing Him to be angry as they were. This is a model for us. We see so many around us who are angry, and sometimes fighting to make us angry. People who are out of control, trying to push our buttons so we, too, may loose control. The image of Jesus quietly writing in the sand is an image that can help us remember that our Christian faith allows for a very different response. Can we respond in love when those around us a filled with hate? Can we keep innocence when others want to destroy? Can we offer forgiveness in a culture that has already condemned? On Wednesday, the local Christian radio station had people call in to share their views on the report that the familiar NIV translation will be undergoing a slight change to make it more gender nutral. The spokespeople at NIV claim it will correct some errors in the translation, and that the intent is not to make it more palatable. They claim their emphasis is on preserving as true a translation as possible. It always bothers me when radio stations and news sources ask for the opinions of people who don't know any more than the news source has told them. The people of Christ shouldn't be judging or jumping to conclusions without knowing a lot more information than we've been given. It surprised me that nearly all of the callers were against the change, nearly all stating that it's another example of the church catering to secular interests. While I am as against watering down the gospel as anybody, and I certainly don't want to see another translation that caters to the secular interests, I readily admit that I don't have enough information to comment on this story. If the good folks at NIV have found some errors in the translation, it seems to me that those errors should be corrected. I personally want to have as accurate a translation as I can possibly have. And if that means changing some of my favorite verses, then maybe I need to learn them over again, the correct way this time. Let's make sure the translation is accurate, then face the consequences if it requires change to make it right. I was thinking as I was listening that the only really truly inspired text was the one that the authors wrote. God spoke through the authors. For well over a thousand years, people had hand copied that inspired text. Did errors occur? Most likely. I believe that the Spirit of God was involved in the copying as well, and that the errors are minimul, but I suspect there are some there. As we pursue our life of faith, we should study for ourselves. You're Pastor might be a good source for more information if you have questions. Many people read the same translation all their lives, swearing that it's the best, without ever comparing. I suggest that you find a couple of good translations (not paraphrases) to base your understanding on. Compare them, note where they differ, and consider why another translation might use a different word in a favorite verse. Paraphrases are helpful in understanding text from a different viewpoint. Don't use them to form your foundation, but it's interesting to see how they may differ. And above all, don't judge. Not about your favorite Bible translation, and not about new stories that you're invited to comment on, even though you don't know both sides of the story. We tend to get wrapped up in our daily lives, busy, and we run the risk of forgetting God and His place in our lives. That's when temptation can lead to sin, and when we can fall into a trap. It happened to King David, it happened to the Disciples, it can easily happen to anyone of us. 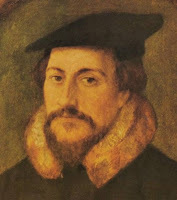 John Calvin is celebrating his 500th birthday this year. At least some are celebrating John Calvin’s birthday this year. The church, the “true church”, is the Body of Christ, and the two indicators of whether a church body is truly part of the Body of Christ is the Word of God preached and heard, and the Sacraments of Christ followed. But we can make this more personal as well. Calvin said the Word of God was preached and heard. Are we hearing the Word of God? Are we paying attention to the preaching and applying what we hear? Are we studying the Word of God on our own, expanding our knowledge of the Word of God, so when it is preached, it will be better understood? Are we open to opportunities to hear the Word of God? And how about the Sacraments? Are we present when the Lord’s Supper is administered? Do we celebrate with those who are baptized? Are we baptized? Do we ever remember our baptism and God’s grace that led to our baptism? We are part of the Body of Christ when we commit to the preaching and hearing of God’s Word, and when we commit to the Sacraments as given by Jesus himself. Yesterday, I shared some thoughts from Bob Buford that were passed along by Chip Ingram. Today, I want to pass along some others comments on adversity that Chip passed along on the most recent Coffee Break CD. Crisis – God’s opportunity to redirect your life in positive pathways you would never have chosen for yourself. Perhaps you can think of a time you had to make a decision or respond to something that was out of your control, but it turned out to be a great move and made a positive change in your life. Confusion – Temporary suspension of the status quo designed by God to help us clarify our gifts and our calling. We’ll never welcome adversity. But we can better manage it when we know that God works through it to bring us to a better place. Some benefits of our adversity??? I receive the Coffee Break CD’s by Chip Ingram, and he gives a short message and some insights on each CD. This month, he had two insights that I want to pass along. Today, I’ll share the first, and tomorrow you’ll hear the other. The first is actually from Bob Buford, who passed this along to Chip Ingram, who shared them on this Coffee Break CD. Bob works with people in their 40’ and 50’s and helps them transition into different stages in their life, and he wrote five reasons why he believes that what is happening today with the economy and the various problems we’re facing, is a good thing for people in this stage of their lives. 1) Adversity causes people to reevaluate what’s really important in their lives. 2) Distress re-centers people on issues of the heart. Rather than issues of rationality. When your in the deep weeds, your mind goes back to the basics. 3) Sustaining a big loss causes people to deal with reality, especially the reality that we are not in control. 4) Where this is abundance, there is a lack of discipline. When we have a lot we don’t have to have a tight budget, when we have a lot we get lazy and undisciplined. God uses times like to this to begin to bring some correction. 5) Thee is a revolution among 20-somethings. They look at us and realize that where we are is not where they want to go. They want to make a great difference, especially a great difference for God, and they don’t see us making a difference. I know that adversity is hard. But it could be the start of great growth process, if we remain open to God, and get really serious about making sure God is at the center of our life.